On November 5, 2008 — the day after Barack Obama was elected president of the United States — the Dow Jones rose 3.3%. On November 7, 2012 — the day after he was re-elected president — the Dow fell 2.1%. I wonder what that means. On election night the numbers got crunched, analysed and crunched again….if only astrology could do that with certainty. The opinion polls had predicted a close race, but it wasn’t. In the end there was no undecided outcome, no legal challenges, no court cases, no voting irregularities and no tied vote. Obama kept on winning electoral-college votes and in the end he won 332 — including most of the crucial battleground states. And he won the popular vote too. It was a sweeping victory — not a race that was too close to call. 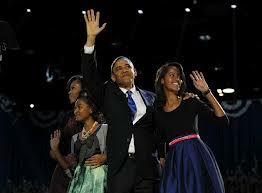 The political analysts on the TV coverage I watched (in Australia) declared Obama the winner 3 hours into the count! Obama got the women’s vote (Venus), the black vote and the Latino vote (Uranus). And Mitt Romney didn’t get enough. In 2008 131 million people voted. This time around the number was fewer — estimated at 129 million. With things not going quite as expected the influence of Uranus — planet of the unexpected — was very evident. And on election-day Uranus was conjunction Moon in the Uranus cycle, Obama had progressed ascendant trine (luck) birthchart Uranus and Mitt Romney had progressed Uranus square (obstacle) birthchart Sun. In previous commentaries reference was made to the discordant aspects forming in the Jupiter (Republican) and Saturn (Democrat) cycle charts but judging deviations to voter intention on election-day was difficult. The discord may have displayed itself as less people voting. But the Libra lunation chart that preceded the election was another story. Its main event was Hurricane Sandy and it did disrupt election campaigning, but whether it influenced the final outcome is anyone’s guess — although Uranus conjunction the Moon in the Uranus cycle was already in orb of influence on October 29. Saturn in the lunation chart conjunction the ascendant did map hardship for many US citizens. And while Saturn is the planet of unemployment and conservative politics it’s also the planet of caution and caution resists change and on November 6 nothing changed. The political analysts will debate the election outcome for ages but whether Romney lost because of his 47% comments, Hurricane Sandy or a poor campaign strategy ignores what’s going on behind the scenes in the progressed charts of both candidates. Brotherhood of Light research into getting a job revealed that people only gain employment when they have a progressed aspect to the ruler of house 10 and house 6. And that these progressed aspects can be harmonious or discordant. But 61% of the charts had harmonious aspects predominant so harmony is an advantage when applying for a job. The tenth house thought-cells relate to the actual job and the sixth house thought-cells to the work and labor that’s involved. Employment involves the job itself, which is ruled by house 10 and the services rendered which are ruled by house 6. The employer in a US Presidential election is the American people and the employment process involves a democratic vote. The person who gets the job gets the most electoral-college votes and usually the most popular votes. In my opinion here are the astrological reasons why Barack Obama got the job and Mitt Romney didn’t. 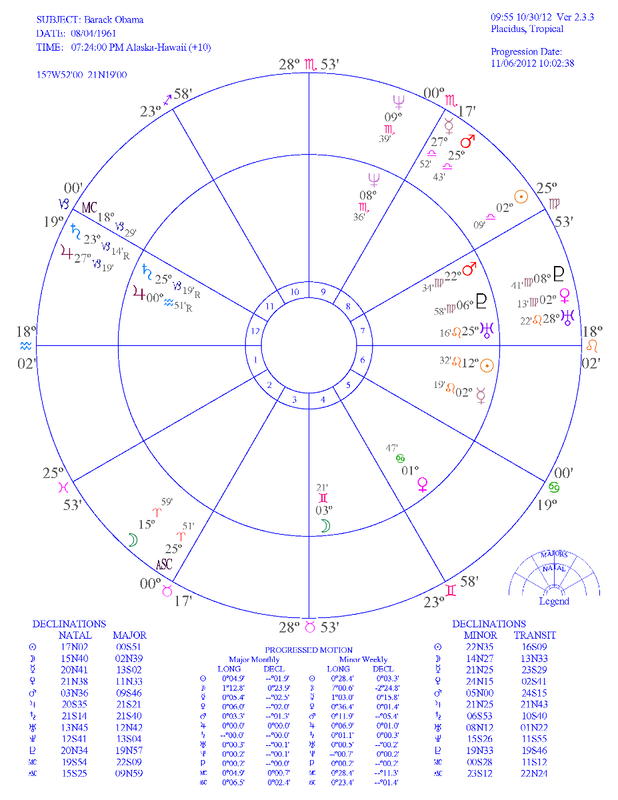 Barack Obama got the job because he had progressed Sun — planet of politics at 2 Libra 09 — in house 8 forming a sextile (opportunity) aspect with birthchart Mercury in house 6. Progressed Sun was also square (obstacle) birthchart Venus, but the Sun-Mercury sextile that kept on getting stronger provided crucial harmony to his Sun thought-cells. 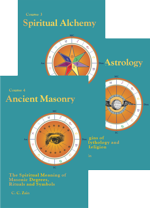 This progressed Sun-Mercury sextile aspect provided harmonious stimulation to his sixth house thought-cells; but progressed Sun square (obstacle) birthchart Venus and progressed Mercury (at 27 Libra 52) square (obstacle) progressed Jupiter (at 27 Capricorn 19) in house 12 were providing discordant stimulation. Progressed Saturn was trine (luck) birthchart Mars (cusp ruler of house 10); progressed Mars (house 10) was sextile (opportunity) birthchart Uranus; and progressed Pluto (cusp ruler of house 10) was sextile (opportunity) birthchart Neptune and these progressed aspects to house 10 provided harmonious stimulation to his tenth house thought-cells. But progressed MC was sesquisquare (agitation) birthchart Moon (cusp ruler of house 6) and progressed Mars was square (obstacle) birthchart Saturn and these progressed aspects provided discordant stimulation. Both house 10 and house 6 in Obama’s chart were experiencing progressed discord but the trine and sextile aspects were providing the luck and opportunity that allowed him to win. 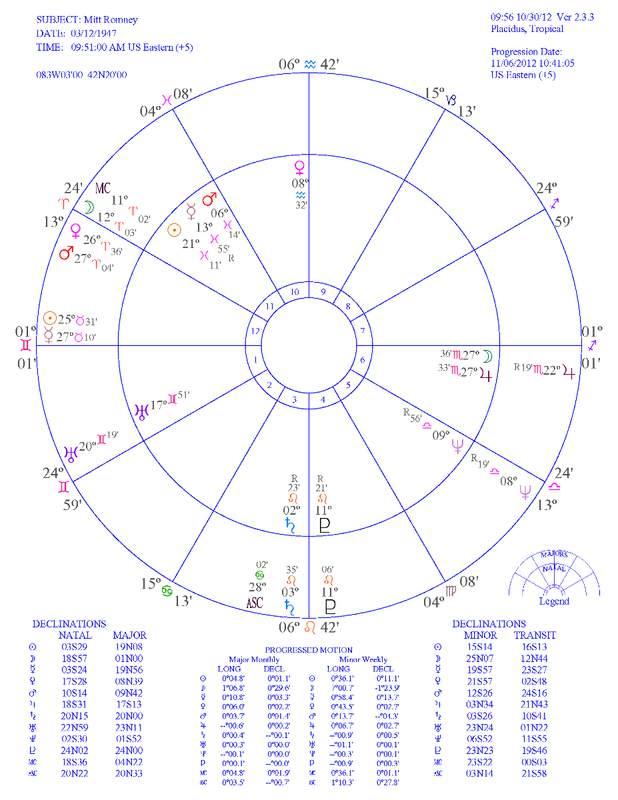 Mitt Romney didn’t get the job because he had progressed Sun — planet of politics at 25 Taurus 31 and 19N08 — in house 12 forming a sesquisquare (agitation) aspect with birthchart Neptune and a parallel (discordant intensity) aspect with progressed Saturn. And progressed Uranus — cusp ruler of house 10 at 20 Gemini 19 — was square (obstacle) birthchart Sun — in house 11 — his wishes. 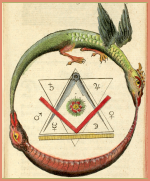 His progressed Sun was not involved in a harmonious progression and the Sun-Neptune progression was very nebulous and risky — Neptune is in house 5 — hazards and risks. Progressed Mercury (at 27 Taurus 10) was opposition (separation) birthchart Moon and birthchart Jupiter in house 6; and progressed Venus (at 26 Aries 36) — cusp ruler of house 6 — was conjunction (prominence) progressed Mars (at 27 Aries 04). So the stimulation to Romney’s sixth house thought-cells was all discordant. And progressed Venus (house 10) — was conjunction progressed Mars; progressed Sun was parallel (discordant intensity) progressed Saturn (house 10); progressed Mercury was parallel (discordant intensity) birthchart Saturn (house 10); and progressed Uranus (cusp ruler of house 10) was square (obstacle) birthchart Sun. So there was no progressed harmony adding fortunate stimulation to Romney’s tenth house thought-cells. In my opinion things turned hazardous for Romney after the first debate. Obama’s poor performance (indicated in his chart by vague Neptune in house 9) gave Romney false hope. That’s when his thinking (Mercury) became over-optimistic (Jupiter) and the temporary thought-cell structures mapped by the Mercury-Moon and Mercury-Jupiter opposition aspects kicked in and influenced his rational thinking. At a time when he needed to keep a very level head Romney was engaging in misguided optimism (Jupiter) and this was the worst thing he could have done. And by mid October progressed Moon had moved to stimulate these Mercury oppositions and his over optimistic thinking. Things hit peak discord on election-day when he announced that he had already written his victory speech. With progressed Mercury — the writing planet — opposition birthchart Moon — cusp ruler of house 3 — writing — and that high discord birthchart Saturn in house 3 — cusp ruler of house 9 (speeches) — he was never going to make that speech. 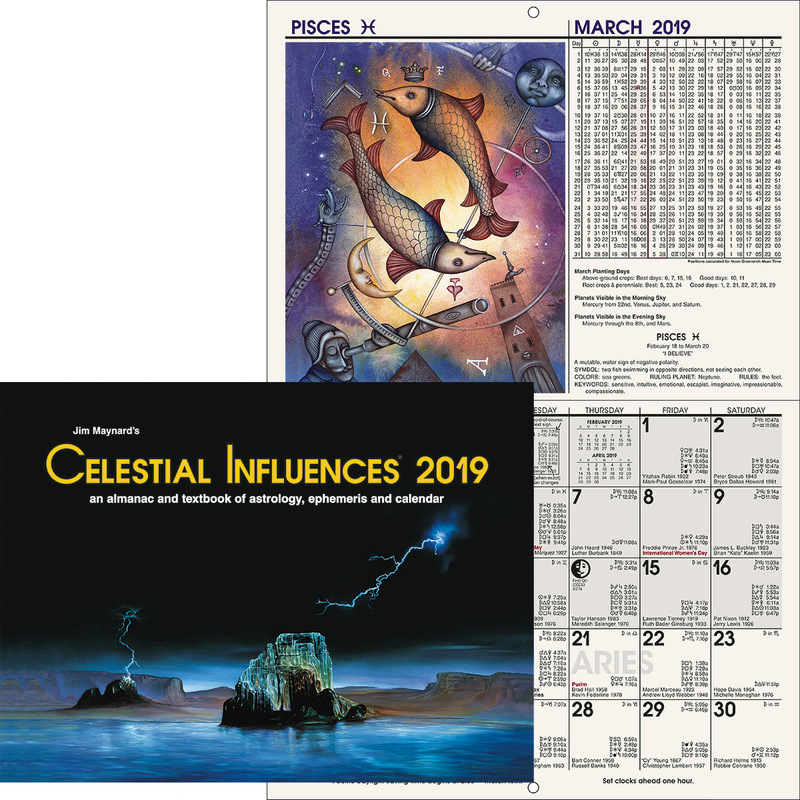 Progressed Sun, progressed Mercury, progressed Venus and progressed Mars in Romney’s twelfth house were all involved in very powerful discordant progressions. House 12 is the house of disappointments and on November 6, 2012 Mitt Romney was a very disappointed man. By the way: The fact that Obama and Biden and Romney and Ryan have their dominant planets in the same degree of the zodiac was just an amazing coincidence. A quick check of other presidential and vice- presidential candidates revealed that the dominant planets in their charts were in different degrees of the zodiac. Every presidential election provides an opportunity for astrological research, but the integrity of the research depends on the accuracy of the candidate’s birth times. So let’s hope that both the contenders in the next US presidential election have documented — birth certificate — birth times. And Hilary Clinton doesn’t.